Handles a number of material handling jobs. Foot-operated pump and dependable hydraulic system raise the load to desired height. 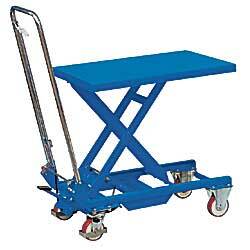 Entire unit rolls on poly wheels and swivel casters with brakes. Other features include: upper lift limit bypass and 1-year limited warranty. FACTORY QUICK SHIPFOB WISCONSIN. XP-1548 27-1/2 x 17-3/4"	 90	 330	 10"30"	 1030"
XP-1549 32-3/4 x 19-3/4"	 172	 550	 12"36"	 1236"
XP-1550 39-3/4 x 20-1/2"	 260	 1,100	 17"39"	 1739"
XP-1551 39-3/4 x 20-1/2"	 264	 1,650	 17"39"	 1739"
XP-1552 39-3/4 x 20-1/2"	 301	 2,200	 17"39"	 1739"
XP-1553 39-3/4 x 20-1/2"	 330	 660	 17"62"	 1762"
XP-1554 39-3/4 x 20-1/2"	 370	 1,100	 17"62"	 1762"
*Available with battery-operated lift. Call for pricing.